Also known as Slavonic Cemetery. with the permission of the author, Norman C. Krischke. The full text can be viewed at the Fayette Heritage Museum & Archives. 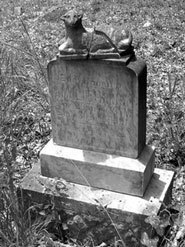 The Slovanska Podporujici Jednota Statu Texas Hrbitov (SPJST Cemetery) at Praha, Fayete County, Texas was established 16 October 1886 by the Cesko-Slovansky Poporujici Spolek No. 104, titled: "Rad Texan" (Czech-slovak Benevolent Society - C.S.P.S.) and the Praha Reading Society (Cetni Spolek) upon purchase of one acre of land in the J. C. Duff League from Anton and Marie Kulhanek for $20.00. 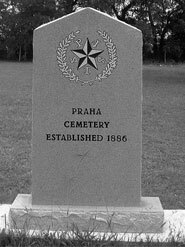 The land is located on the north side of Mulberry Creek Road with gate one-tenth mile west of FM-1295 opposite St. Mary's Cemetery [Praha Catholic Cemetery]. The plot of ground measures 37 1/2 varas by 150 varas (104 feet by 416 feet). The SPJST Cemetery is bounded by a cedar post-barbed wire fence on the north and east sides. A similar fence was located on the west side but is now gone. The south fence was of cedar post-barbed wire with wood rails at top and bottom. The entrance gate was of wood; now gone. 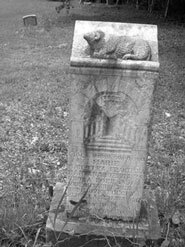 The first grave was that of Jakub Wincik whose tombstone is inscribed in both Czech and English. 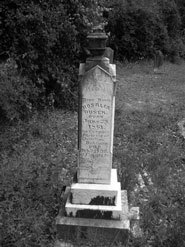 He was born 8 July 1841 and died 8 July 1892. All tombstones face to the east. There is one brick lined grave that is unmarked. Fayette County Death Record, Vol. 2, page 216: Frank J. Nesrsta, born 12 February 1884, died 12 October 1913. Married, Farmer. Born Fayette County, Texas to Charles and Katerina (Kopecky) Nesrsta. Buried 13 October 1913. S/C.F. Nesrsta. No data; "J" is reversed on stone. 1. Information from Marcia Zabransky, who wrote that Aneska Zabransky immigrated with two children, Anton and Marie. She later sent for her two grandchildren, Antonia and Frank Joseph Zabransky, who were 9 and 5 years old and came over on a ship by themselves.